Intellectual Property Basics - Trademarks — St. Augustine Law Group, P.A. This blog will focus entirely on Trademarks, and how they may be used to protect your brand identity in the marketplace. Continuing our discussion on Intellectual Property and your business, today's blog is about Trademarks. 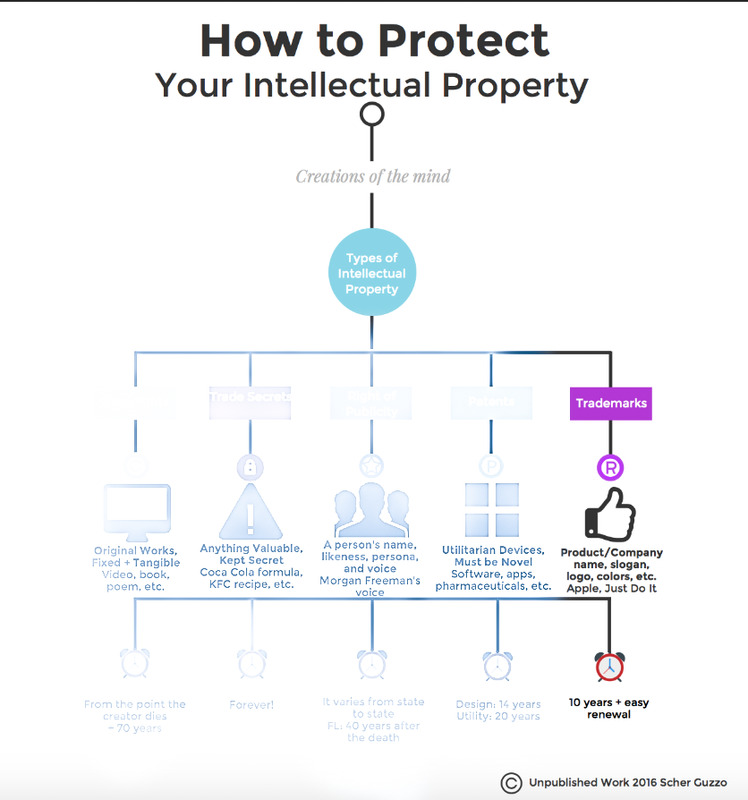 If you've not read our introductory blog on Intellectual Property, CLICK HERE to review it to get a general lay of the land. In general, Intellectual Property deals with creations of the mind. Intellectual property can be divided into a few distinct subcategories, Trademark being just one. Definition: any word, name, symbol, or design, or any combination thereof, used in commerce to identify and distinguish the goods of one manufacturer or seller from those of another and to indicate the source of the goods. Basically, a trademark is a word, phrase, symbol, or design, or a combination of these, that identifies a "good" in commerce from others similar to it. Some examples are the Nike slogan “Just Do It” and the company name “Apple”. Trademarks may be claimed by registering them with the USPTO/State or under the doctrine of Common Law usage. What’s the Point of a Trademark? How Much Protection Do I Get? Constructive Notice to general public nationwide. Ability to petition if exclusive use/incontestability after 5 years on the "principle registry"
Opportunity to collect triple damages and attorneys fees in a lawsuit in which you prevail. A common law Trademark is signified by using "TM". In effect, by placing TM next to your word, phrase, symbol, or design, you are stating that to the best of your knowledge, you are the first to use that word, phrase, symbol, or design. However, you must be vigilant in your defense of this common law claim. If not, you risk losing your common law trademark to someone who has registered with the USPTO. Do I get to keep my Trademark forever? Once registered, yes(ish). In order to maintain your registered trademark, you must renew it in accordance with USPTO procedures. In addition, you must ensure that you are taking adequate steps to protect your mark in the marketplace. Do those things, and your trademark can belong to you or your company in perpetuity. I have a domain name, and have registered my business with the state. Isn't that enough? Just having ownership of the domain name or registering your business in your state does not give you automatic trademark rights. Some states do not even cross-reference the DBA database with their entity database. This could result in two companies with the same name, within the same state. Sound like a lawsuit to you? You should be careful when choosing a business name/domain name, because it could potentially infringe on someone else’s trademark. I don't sell goods, but want to protect my name. Can I still get a Trademark? In short, YES. A "Service Mark" is a type of trademark that refers to SERVICES, not good. It is used to register your name or mark that distinguishes your company from its competitors. Non-registered service marks are symbolized using "SM". There is much more to Trademarks than meets the eye, or can be discussed in one blog post. If you are a business owner concerned with protecting your brand identity, Contact Us today to set up a free initial consultation to determine if Trademarking your name or mark is right for you.